Natures Home magazine uncovered What happens when you put 100 RSPB scientists in a room? At the conference, RSPB scientists from all over the UK get together to share findings from their research, do workshops and share ideas. It's great to get invited so thanks to Guy Anderson for allowing me to come every year. I get loads of ideas for features and stories in Birds from going and finding out what's been going on over the last year - and what will be happening over the next year. It is AMAZING how much great work is happening to help find out the reasons for species declines, for example, and some of the latest findings from ringing and tracking work. I also get to meet some of our fabulous scientists. I already know quite a few - one of my favourite parts of my job is that I get to meet so many RSPB colleagues through my work - but I enjoy meeting new people and putting faces to names at this event. I actually ran a workshop myself this year which was about gathering top stories from the scientists for RSPB communications - and of course Birds magazine is my priority. I was a little worried to have drawn well-known japester Nigel Butcher in my group (you'll get to read all about him in the next issue of Birds), but I love a bit of banter and Nigel came up with a terrific story involving filming peregrines and Take That turning up to steal their thunder! I actually thought he was joking, but the location where the birds nest is a site for many famous films and videos being made. Everyone in my group pulled out a top story about their work, which was great. Another highlight of my visit was the flock of 65 waxwings that were gobbling berries just a couple of hundred yards up the road from the conference centre. I took three trips during the day to see them (in breaks I might add!) and was sad to pick up a dead one at dusk. A car must have hit it as it swooped across the road or came down to drink. I was amazed at how heavy the bird was - it must have been full of berries. Very sad, but what a privillege to hold such a stunning bird in your hand. So, I'd like to say a big thank you to all the RSPB's brilliant scientists, like Nigel, who are using your generous donations and membership fees is such a valuable way - finding out how we can help to save our threatened wildlife. I'll be posting on this blog every Friday now, so check in to find out what's been happening behind the scenes of Birds magazine. I've literally just finished off the January issue in the last hour and we'll be sending it to the printers on Monday. I'm really pleased with how it's shaped up. I hope you enjoy it. 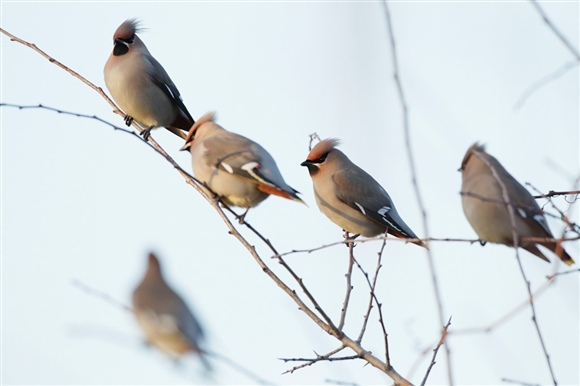 I heard reports yesterday of one flock of waxwings suffering casualties from some hitting a notorious building in Peterborough. It's also had 3 woodcocks fly into its windows in recent weeks. Very sad. Sorry I've been away on holiday so I am a little late reading your most recent posts. I do like the way that Birds is giving us more insight into some of the characters around the RSPB like Mark Gurney and Ellie Owen in recent issues. Dr Butcher does sound like a bit of a character too. I for one, find it very interesting to learn more about some of the great staff the RSPB have. Really great your saw waxwings as I have observed them on my local patch in the last few weeks. The fact they are feeding close to roads means the inevitable road casaulty unfortunately.